University research proves these gloves are the best on the market. Only the tokushuTM series gloves contain the state of the art Deltra EGTM inner core, shown to display the highest level of glove impact characteristics for maximum performance and protection. The tokushu's patented Dual-XTM closure system and Fusion SplintingTM are sophisticated designs that ensure perfect hand/wrist alignment, maximizing striking power and injury prevention. VylarTM is a new cutting edge engineered leather that was proven to display ultra high performance scientifically proven in University research to be superior to other tested materials. The tokushu's specialized EctaTM carbonized bamboo lining deliver a comfort and quality that you only get with Hayabusa. 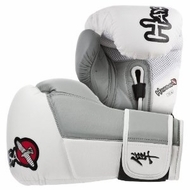 Put your trust in Hayabusa's tokushuTM series -the only combat equipment proven by science.